Recent release “My Heart Belongs to Teaching” from Page Publishing author JoAnn Tryloff is a lovable book that reflects delightful moments of spending time with kids. JoAnn Tryloff, a graduate of Michigan State University with a degree in education, and a teacher in California and Michigan for thirty-one years, has completed her new book “My Heart Belongs to Teaching”: a captivating narrative showing funny, embarrassing, and happy circumstances in the company of children. Published by New York City-based Page Publishing, JoAnn Tryloff’s endearing tale is a collection of the author’s heartwarming moments together with her students and other children through different life-changing experiences. 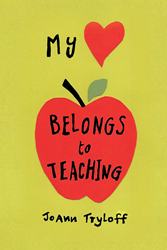 Readers who wish to experience this treasured work can purchase “My Heart Belongs to Teaching” at bookstores everywhere, or online at the Apple iTunes store, Amazon, Google Play, or Barnes and Noble.